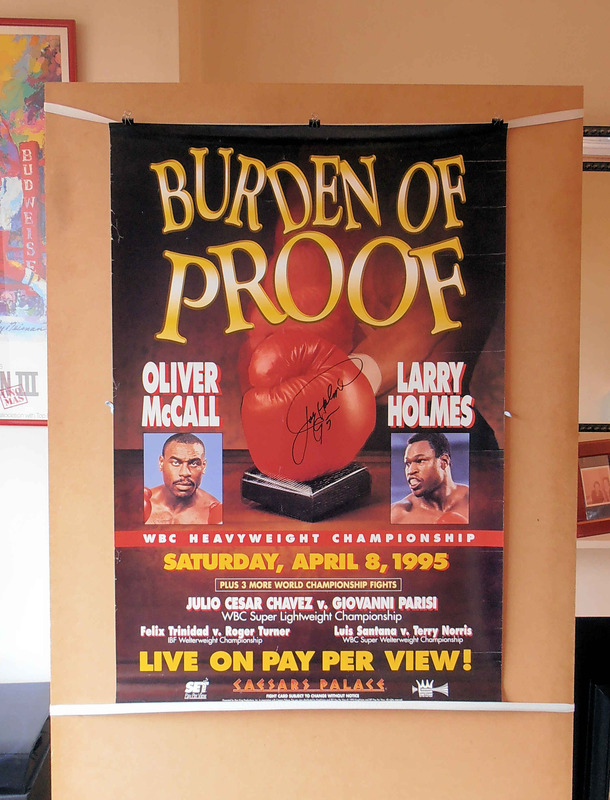 Description : Here we have an authentic Larry Holmes autographed (Kingvision) Pay-per-view poster from Caesars Palace, Las Vegas, Nevada, USA, 8th April 1995, for the WBC Heavyweight Title fight between reigning & defending champion Oliver 'Atomic Bull' McCall & challenger, former WBC heavyweight king, Larry Holmes. 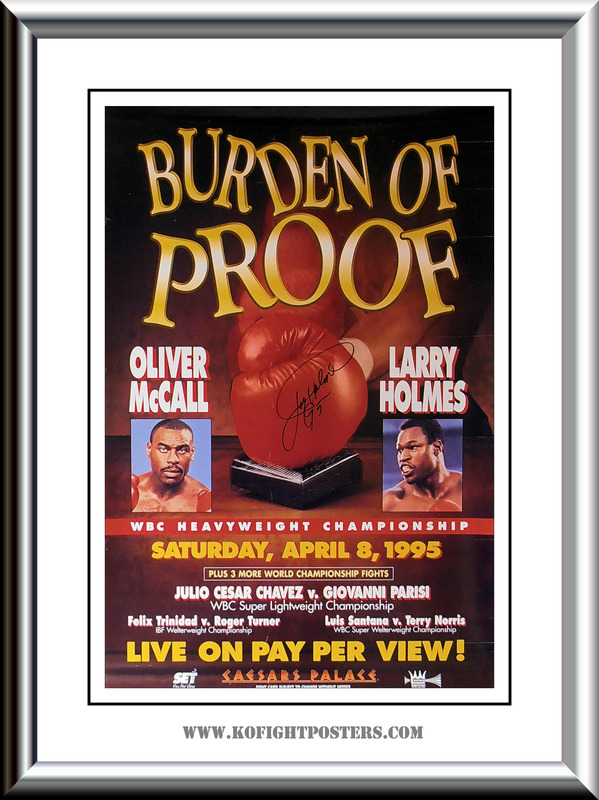 A serene 45 year old Larry Holmes gave newly crowned WBC champion Oliver McCall all he could handle in this bout. McCall, who was two weeks shy of his 30th birthday, seemingly pulled it out in the latter rounds. The aging legend appeared to take an early lead by out-jabbing and outfoxing his aggressive 29 year opponent. 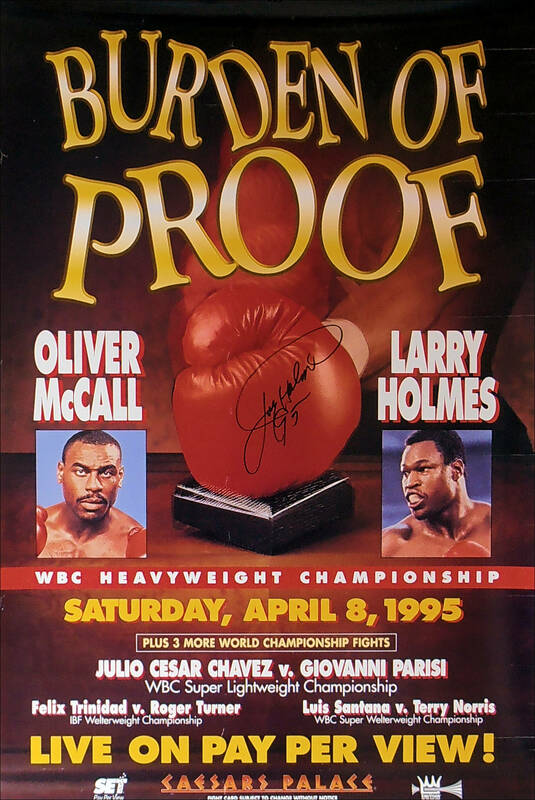 Larry Holmes used his experience and ring guile to land hard right leads to McCall's chin. However, the new champion wasn't without fireworks of his own as he used rough-house tactics to get Holmes off-balance and unleash quick, snapping counter-strikes of his own. The turning point came in Round 9. From then on, McCall was able to land more frequently on a tiring Holmes, even stunning former the former champion late in the fight. In the end, the champion had more left in his tank than the challenger, winning at least 3 of the 4 final rounds to escape with a unanimous decision. The scores were 115-112, 115-114 and 114-113. What many forget about this bout is the 45 year old Larry Holmes almost dethroned a 29 year old heavyweight thoroughbred who was in his prime. The legend announced his retirement after the bout but would later make several comebacks. This original Don King Productions 'Kingvision' PPV poster represented here has been signed by Larry Holmes, and comes with a letter of guarantee of authenticity from KOfightposters.com for a lifetime & beyond. Condition : Fair/handling-edgewear & some creases/framed 4 display only!